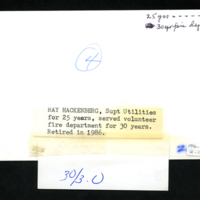 Ray Hackenburg, Superintendent of Utilities for 25 years, served volunteer fire department for 30 years. 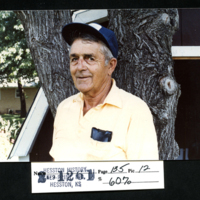 Retired in 1986.
unknown, “Ray Hackenberg,” Hesston Public Library, accessed April 19, 2019, https://hesston.digitalsckls.info/item/1496. 3.25 in. x 5.5 in.